Prejudice, n., v., -diced, -dicing, n.
Now there's a bad word for you. It's often used in politically correct rhetoric. And I'm sad to say there is prejudice involved in Texas-style cooking, as well as in other styles. Most often heard here in Texas is "If you know beans about chili, you know chili ain't got no beans". 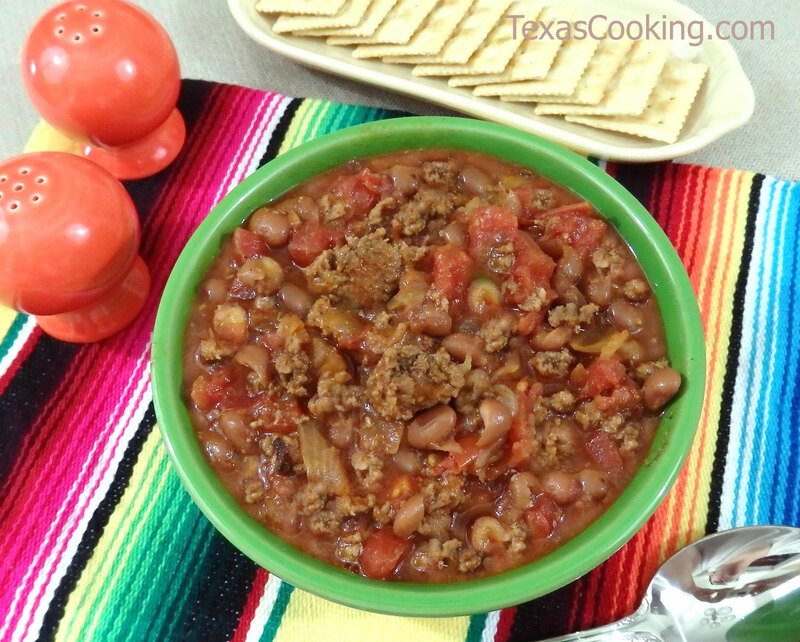 It is a near hanging offense to serve up chili with beans in it down here in the Lone Star State, although you can skirt the issue by calling the dish "chili beans". I have read hundreds of chili recipes and about 75 percent of them call for beans of one kind or another. As in most cases of prejudice, it all comes from pure, simple ignorance. Here in the chili belt, we talk in shorthand sometimes. When we say chili, we really mean chile con carne, which means, literally, chile peppers with meat. Chili with beans would be Chile con carne y frijoles. Border Spanish also has a hand in the prejudices. It is just fine with me if you want to put beans in your chili, as long as they are not white beans. White beans do not belong in chili. That was written on the back of one of the stone slabs Moses brought down off the mountain. Another misnomer that has appeared on the scene is chicken fajitas. There is not any such animal. The word fajita means flank beefsteak, not marinated chicken breast. If your fajitas contain any meat other than flank steak, they are not fajitas. A chicken fajita is one that would not cross the road. In another venue, the words grilled, broiled, smoked and barbecued are used interchangeably. In a lot of places, barbecue is burgers and wieners on the backyard grill. But not in Texas. The recognized definition of barbecue is "Meat or other foods cooked in close proximity to an open fire or coals, with sauce applied". If you cook it slow and easy without saucing it, it's smoked. If it's cooked on a grill over a hot fire it's broiled. On the grill over a slow fire, it's grilled. I have a good buddy who insists that cornbread does not contain sugar. I personally like a little sugar in my cornbread. Another friend does not like sage in his pork sausage. To me, pork sausage without sage is bland. I was really upset once when good friends put catsup on my prize-winning butter beans. What a breech of good taste. But a cousin of mine looks daggers at me when I put catsup on his broiled sirloin. I don't eat seafood other than fried fish or the occasional shrimp, broiled or fried. I have visions of the various mollusk and Crustacea sitting on the bottom of the ocean happily lapping up fish droppings and filtering heavy metals out of the water. So there. "So what does this all mean," you ask? It means that cooking is not an exact science. A recipe is a rough guide rather than one of nature's laws. If the recipe calls for garlic and you break out in hives when you eat garlic, leave the garlic out. Cooking is like any other craft; experience is the best teacher. The novice cook would do well to follow a recipe as close as possible. After he or she becomes comfortable with it, changes can be made if desired. The seasoned cook (there's a little play on words) can get good results from a familiar recipe without measuring anything. The one place where you want to follow directions is where it tells you the proper cooking temperature. I always want the beginning cook to get a good set of thermometers so he won't be disappointed with his results. For example, did you ever try to make candy without a thermometer? Do you really understand soft ball stage, hard ball stage or threading? I don't. And the baking of breads requires paying close attention to the oven temperature. Another very important thing experience will teach you is timing. You want all the components of a meal to be done at the same time. If your main dish is running an hour late, your guests will have eaten all the bread sticks and be starting on the napkins before it gets to them. You start with the item that takes longest to prepare. A lot of modern recipes include preparation time. If the time is not indicated, your experience will have to take over. Some dishes like batter-fried things do not hold well. If you set them aside to wait on the rest of the meal, they will get soggy and bland at best. On the other hand, thick cuts of meat such as really thick steaks and roasts need to "set" a while to let the cooking process stop. Usually fifteen minutes for the set is recommended. Any meal should be a civilized affair. I don't mean that your meals should be so fancy that you put out six or eight different kinds of forks, each with its own task. Pleasant company, pleasant surroundings and decent table manners make for a memorable meal. I've seen meals that look like a pride of lions feeding on a zebra. I won't name names here. You can have a fine, family-style meal with the pot sitting on the table as long as the pot is clean on the outside and doesn't look like you have been using it for oil changes on the pick-up truck. Nice serving dishes really add to a meal. If you have one that Granny Hooper fed Andrew Jackson out of, so much the better. A nice cloth napkin is an asset, and a roll of paper towels passed around works at an outdoor barbecue. But wiping your mouth on your sleeve will get your name off the "A" list. A good host or hostess will make provisions for guests who may for some reason not want to eat what is being served. You should check at the time you invite your guest to see if such will be the case. You can either tell them what you are serving ahead of time, or come right out and ask if there is anything that they can't or won't eat. A guest on a salt-free diet, for instance, could be accommodated by setting his serving aside sans salt. The Number One rule when cooking for guests is go easy on the alcohol while you are cooking. There is nothing that screws up a good meal like a drunked up cook. I hope you have found something here that will help you farther down the road. So until next month, cook and eat with joy.